Are you expecting a new bundle of joy soon? Congratulations! Whether you’re a first-time parent or you’ve been down this road before, welcoming a new baby to the family is an exciting time. Part of that excitement is the nesting stage where you’re preparing your home for your newborn. During all of this cleaning and organization, you may also be in the middle of designing or decorating a nursery. There are tons of options when it comes to choosing a color scheme for the nursery, which can feel a bit overwhelming. Luckily, with these nursery decoration tips and a handy paint calculator, you’ll be able to set up the perfect room for your little one. Deciding what color to paint your nursery is one of the first steps in your design planning. It’s long been proven that colors can affect someone’s mood. Do a little thought experiment for a moment: Imagine you walk into a room that’s painted bright yellow. How do you feel? Happy, energetic? Now imagine walking into a room that’s painted light blue. Is your mood different? Maybe calmer or another feeling entirely? 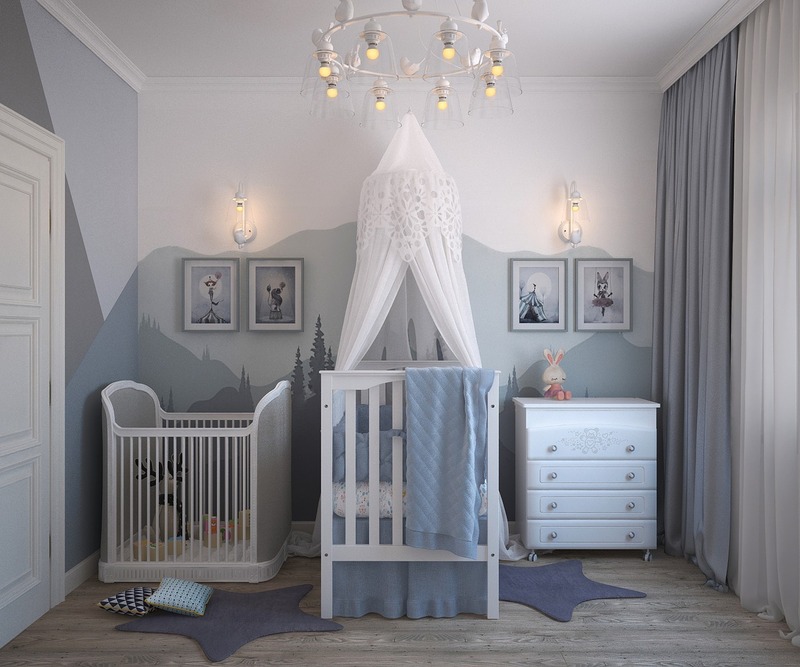 While some colors often evoke the same kinds of emotions for many people, it’s still very subjective, and you’ll have to decide what feelings are sparked by the various options as well as what kind of environment you want for your baby when choosing a nursery color. Perhaps you don’t know the gender of your baby, or you want to think outside the box rather than going with the traditional pink for girls and blue for boys. No problem — there’s a whole world of colors out there for you to choose from! Green, yellow, orange, gray, and brown are all gender-neutral color options, and within each of these is a wide range of shades. Of course, don’t count out the trusty white either! Regardless of which color you choose, stick to a shade that’s not as intense (or in technical terms, not as saturated), as this will promote a more soothing environment. Soft, lighter shades are a good way to go for entire sections of walls, while bold colors can be used as accents. A major part of being a parent is looking out for your baby’s safety, and that holds true even before they even come into this world. There are lots of different paint brands and manufacturers out there, and you want to make sure you’re going with a product that won’t jeopardize your baby’s health. When looking for safe paints for a nursery, try and go with water-based, zero-VOC paints, or at least low-VOC paints. VOC stands for volatile organic compounds, and these potentially harmful chemicals can be released into the air during painting. You may also want to consider getting paint that doesn’t require a primer in order to minimize the number of chemicals used with your painting. Once you’ve settled on a color, you need to figure out how much paint you will actually need in order to paint the nursery. The quickest way to do so is to get the dimensions of the room and input them into a paint calculator. Then, just like that, it’ll tell you how many gallons of paint you’ll need to buy, and thus how much you can plan on spending. If you’re painting the nursery yourself, don’t forget to read up on some tips for a DIY paint job so your project can go off without a hitch. Tackling the job yourself can help you save money, and with a new baby on the way, every buck in the bank can make a difference. If the room has wood flooring, add some soft rugs to make the floor kid-friendly for playtime. Don’t forget about the adult using the nursery: Invest in a comfy chair for you to use when in the room. Get plenty of storage shelves so you can easily organize your baby’s clothes, toys, and books. You’ll be surprised at how quickly their things will pile up! Look into lamps and a nightlight to add warm, cozy lighting to the space. You can also get a dimmer for the bright, overhead light. Have good shades or curtains so you can make the room dark when it’s time for your baby to sleep. Secure the room with baby-proof equipment, such as blocks for the electric outlets. Choosing a color for your nursery is one of many decisions you’ll be making as a parent. Keep in mind mood, brightness, and VOC levels when deciding on a paint, and use a paint calculator to figure out exactly how many cans you’ll need for the job.